"Rare Beach Front Development Opportunity"
"Grand Hacienda Style Beach House"
"Amazing Ocean Front Estate "
"Marvelous Home on 2 lots." 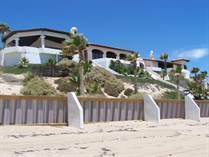 "Beachfront Casita with Room to grow." 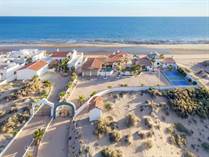 "Beach Front on Large Lot"
"Views to Sea of Cortez"
"Beautiful beachfront home in Sec 5 Las Conchas"
"Best beach in Rocky Point Amazing home huge lot!" 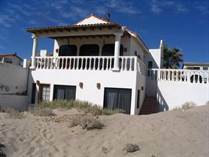 Las Conchas is the subdivision located just before what is considered the "Eastern Beach" area. "Las Conchas" means "The Shells" in Spanish. The majority of homes in this community are mostly houses and one story townhomes. As you drive through the 24 hour guarded gate, you'll see an array of well-maintained lightly colored homes. 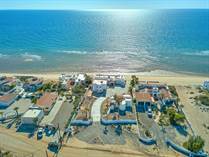 A feeling of peaceful beach house living comes over you and the excitement of enjoying a cool drink on your margarita deck or ocean front patio overwhelms you. 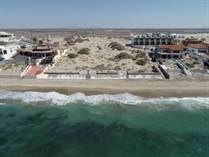 Las Conchas could be considered one of the most desirable locations to live in Rocky Point since it is only a few blocks from town. In a few short minutes you have access to grocery stores, restaurants and the old port where ships are docked and tourist attractions are abundant. Americans who respect privacy and good living mostly live in Las Conchas. You'll never feel uneasy in this community since guards patrol the beachfront 24 hours a day. HOA fees are very reasonable and can be paid online. There are homes of every style, size and price in this ideal community. Please view all of the listings to make one of these houses your next home.